The blog for those with a chronic film obsession. 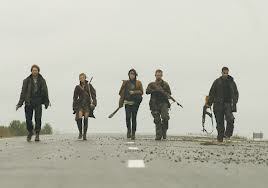 The Day is a new post-apocalyptic horror film with a whole host of actors you know from other genre films. I liked it but didn’t love it. We saw this film at the Sarasota Film Festival in April. The filmmakers were in attendance along with actors Ashley Bell and Dominic Monaghan. You may remember Monaghan best as the hobbit Merry from the Lord of the Rings trilogy and as Charlie on Lost. He was affable during the post-viewing Q&A – maybe even endearingly goofy. It was clear that he enjoys interaction between the audience/fans and himself, and I always respect an actor for this. Similarly, Ashley Bell (the tortured young girl from The Last Exorcism) was incredibly gracious toward the audience and her experience on the film. X-Men’s Iceman Shawn Ashmore and Shannyn Sossamon round out the principal cast. Michael Eklund continues his run of creepy roles as the chief of predatory clan. Eklund brings a feral quality to the role that other actors would have spoiled by overacting, lack of nuance, or an overindulgence in the cheese quotient. The basic premise is a devastated earth yields little fuel, animals, or food for the remaining human race. Survivors band together to scavenge what they can to subsist, but ruthless clans of predators have picked off many of these intrepid human remnants. Five somethings are being tracked by one of these clans, and rather than run and be picked off one-by-one by the ruthless trackers, they hole up for a final stand in an old farmhouse and prepare for battle. Luckily, this protypical siege film is pretty true to its genre and premise. It’s straightforward in that if the premise sounds appealing to you, you will probably like it. If it doesn’t sound like your cup of tea, it likely isn’t. The Day does not pull its punches. The “preparing for battle” montage was probably my favorite scene of the movie. Cornered without arms, the quintet use ingenious methods to cobble together weapons and traps for their would-be assailants (who of course are expected to arrive at dark). The gore is not over the top, but do know that most of the combat is of the hand-to-hand variety, and a female is tortured practically to the point of losing consciousness. As for the shooting aspects, the film was beautifully shot in a muted palette. The colors of the world have bled out with the last bastion of humanity, and it adds a really gritty atmosphere to the film. You may even forget from time-to-time that the film was shot in color because the landscape is utterly gray and dreary. The filmmakers were coy when an audience member asked what caused the apocalypse, but they seemed to insinuate it was possibly environmentally-related. It seemed they didn’t want you to question to “why” or “how” of their set-up, but just get immersed in it. I think this is partially folly – while I get they are not trying to make a Message Film, trying to analyze the plot beyond what was shown on-screen was not rewarded. WWE Studios is distributing the film. According to VideoETA, the DVD is slated for a November release if you don’t catch it in its limited theatrical run. The trailer is here, but I would advise against seeing it; the trailer reveals a fairly significant and unanticipated spoiler than I was glad not to know going into the movie completely blind. Recommendation Level: Recommended (if you are a fan of the genre). I love balance and equilibrium. I shrink from all views/methods extremist, obsessive, and militant. Except when it comes to cinema. I’ll have to give this one a watch, just because it has some guns and action – be something I can sit down and watch one lazy evening. I won’t bother watching the trailer, now either. Thanks for the review. Great, thanks for the comment! There is definitely loads and loads of action in this. Even the dialogue-heavy scenes are juxtaposed with intense suspense, so it never really lags.